Had anyone other than Auburn won the BCS National Championship, this season could have been marginally salvaged. Instead this is the season that showed once and for all that College Football is ruled by the big 6 conferences (including Notre Dame) and the bowls. In short, the BCS runs things, not the NCAA. That Cam Newton won a Heisman and a National Championship is a travesty of the current system. Yes, he is a great player, but he should not have been eligible to play in either the SEC Championship Game or the BCS Championship game had they reached it. Last summer, after Pete Carroll and all their top NFL quality players had left, after USC was set up for a down year, the NCAA finally concluded a 3 year investigation and sanctioned USC because in 2006 "(Reggie) Bush's mother, brother and stepfather had lived in a San Diego-area home that was owned by a would-be marketer who planned to be part of a group that represented Bush when he turned pro." (LA Times) Did you get that? Cam Newton played originally for Florida behind Tim Tebow where he played in one game, was injured, redshirted, arrested (but not convicted) for stealing a laptop, suspended, and left. He played one season at Blinn College and won a Junior College Championship. (Cam Newton) For this season he wanted to play at a major college program again. While shopping for a school, his father solicited money in a pay-to-play plan from Mississippi State. That's a fact, and a clear violation of NCAA rules. He should have been ruled ineligible. And he was, briefly, then reinstated. Why? Because the NCAA claimed there wasn't enough evidence to prove that Newton knew of his father's actions... really? So if Reggie Bush had said he didn't know his parents were living in that house it would have been OK? So now as long as you maintain plausible deniability a player's representatives can ask for anything? And we're really to believe he got nothing to play for Auburn? It's not like Auburn was a school on the cusp of greatness. They weren't even ranked in the preseason AP poll. They went 8-5 in 2009, a miserable 3-5 in the SEC, and needed overtime to beat Northwestern in the Outback Bowl. 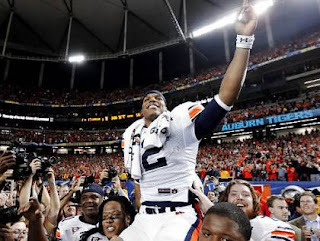 (2009 Auburn Tigers football team) They hadn't won a title since 1957. This was his first choice for purely altruistic reasons? I'm really supposed to buy that? Newton was reinstated simply because the SEC needed him to be. Had Newton's violation not been leaked to the press by Mississippi State officials angry over the slowness of the investigation, the NCAA would have done what they did for USC: dragged their feet for years until it would no longer affect games happening at that moment and then ruled. Instead they bent their rules to allow Newton to play. He won his Heisman and his Championship. He'll leave for the NFL for a big(ger) salary. The SEC got their championship which they now believe to be their god-given right, and all is well with College Football. Except for the fact that the NCAA has lost all credibility. Take Ohio State's violations at the end of the year. Five players were found to have violated NCAA rules by improperly selling items and accepting benefits. Mysteriously they all were suspended for the first 5 games of next season. Nevermind that most of them could go pro and avoid punishment at all. Why were they not suspended for the Sugar Bowl? Because the Sugar Bowl and the Big Ten needed them to play. They were OSU's star players. Without them, Ohio State wouldn't have had a chance. No one would have watched, and the Big Ten would have lost all of its bowl games. Instead they scratched out a victory over Arkansas to prove they can match up against an SEC team (albeit an SEC team that couldn't even win its own division) and all is well with College Football. Last summer the big 6 conferences put the fear of god into the NCAA. They made rumblings of forming mega-conferences that would have swallowed up most or all of the relevant football and basketball programs in the country. Then they could just leave the NCAA and form their own association. One that allows them to recruit players however they want and... drum roll please... to pay them openly. So if all those people at the NCAA want to keep their jobs, they'll do anything the BCS tells them to do.